There are so many products that we use around the house and don’t realize they include toxic chemicals and are harmful to our health and our families. 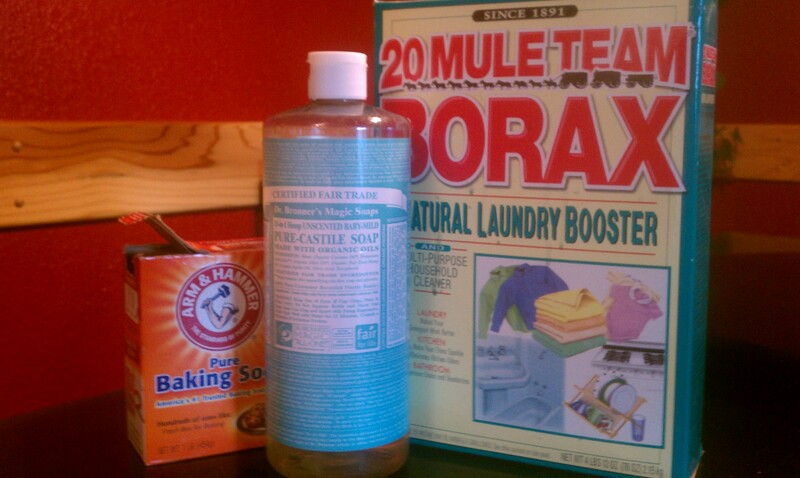 This is a recipe from one of my favorite blogs, Wellness Mama, for a natural, chemical free all purpose cleaner. We keep two bottles (of different scents) to use in our kitchen and family room for counters, table tops and floors as well as in the bathroom. I boil water on the stove in a teapot and then pour into a non-plastic pitcher and add the above ingredients and stir. I let it sit until it cools and then pour into the spray bottle. Even though there are only 4 ingredients, some of the ingredients might be foreign to you. Above is a picture of each of the ingredients except for the essential oils (essentials oils can be purchased at Natural Grocers, Whole Foods, health food stores and distributors.) There are different grades of essential oils as well as organic versus non-organic…those are next on my list because I don’t know enough about them to recommend a specific kind. For castille soap, I use the unscented Dr. Bronner’s because it is an organic soap made from extra virgin coconut, olive, jojoba and hemp oils. It can be purchased online, at Natural Grocers, Whole Foods, etc. We also use it as our laundry detergent, either the almond or lavender scent. Just a capful for a load of laundry since it is a concentrated soap. Normal laundry soap is one of the MOST toxic cleaning items in your home. Borax, sodium borate, is a mineral that has been used for a long time as a component of detergents and is a natural laundry booster. It can be purchased at your local Target or other large box retailer. The same goes for purchasing baking soda or washing soda. Not only does this give you a toxic free all purpose cleaner…it provides it at a much lower cost than purchasing already made at the store. Make it once and you will be hooked! If you want to check the toxicity level of any of your household cleaning products you can do that by going to EWG’s cleaning product database and typing in your products.